The good news is that the stewards have rejected the protests against the diffusers, which use a loophole in the regulations, of Brawn GP, Williams and Toyota. That means that the cars can race as they are and we will get the chance to see whether the Brawn BGP 001 really is as quick as we (and all the other teams) thought. Unfortunately, it also means that the protesting teams (Renault, Red Bull and Ferrari) are appealing against the decision and we will have to wait until the FIA International Court of Appeal meets to discuss the matter before having a final ruling. That cannot happen before the Malaysian GP and, in the meantime, the results of the early races will be provisional. It is a shame that the matter was not dealt with by the FIA giving a definitive ruling when the diffusers were first queried. Theories abound that the FIA has deliberately delayed the decision-making protest in the hope that the fuss would split the unity of FOTA but that is the way it has been handled and the sport must live with a long wait before a final decision is made. In the meantime, you can bet that the protesting teams and the rest will be designing diffusers similar to the controversial ones, just in case the appeal fails. Of the teams that have the loophole diffuser already, Toyota is said to be ready with alternatives should the device be ruled out. Brawn GP and Williams may find it more difficult to fit such potentially wasteful expenditure into their budgets. BMW, whose protest was thrown out on a technicality, may be in the worst position, Dr Mario Theissen having already said that the design of their car's gearbox makes it impossible for a loophole diffuser to be fitted. And McLaren are sitting quietly while, no doubt, their designers are working flat out on loophole diffusers of their own; the device could solve a lot of their car's problems with airflow at the rear, after all. Even as a BMW supporter, I have to say that the diffuser should be accepted as legal. Clearly, it does not contravene the regulations and the protests against it could do little but complain that it breaks the "spirit" of the rule. That is obviously irrelevant, since it is not up to the designers to consider the spirit or intent of a rule - all they can do is make sure that their design is within the letter of the law. If the lawmakers have not been clear enough in writing the rules and have left loopholes, the designers have to exploit such deficiencies. That is what F1 is all about, after all - designers have always found a way to beat the legislators and, hopefully, they always will. Most of the advances made in the design of the cars are the result of some clever engineer spotting a loophole and using it to make his car faster; the rest follow. Take a look at a modern F1 car and previous loophole designs are evident everywhere. The raised nose, for instance, the extended floor to create the splitter, Ferrari's hole in the nose last year, all are the result of designers seeing beyond the regulations and creating solutions that the lawmakers did not foresee. With the present threat of standardization looming over the sport, the inventiveness of the engineers becomes doubly important. Were they not to find the loopholes and exploit them, F1 would already be a formula in which the cars are all the same and no creative ideas would flow from racing into the world of production cars. New solutions will also bring protests, of course; the teams without the innovation are bound to be annoyed that their designers were not the first to spot the loophole. Sometimes designs can go beyond the letter of the law and then they can be defined as cheating, in which case it is only right that the protest should succeed. But, when the law fails to cover an area exploited by a designer, the team should benefit from his greater ingenuity and the protest fail. If the FIA considers that the spirit of a law is being broken, the only recourse should be to tighten the regulation at the end of the season. This is a sporting and competitive issue, it's nothing personal against the teams, it's simply looking to clarify regulations and our interpretations and others has been different. This is just stupid! Provisional results are grossly unfair. This means that if the appeal is thrown out the other teams will have sacrificed 2 races in which they could have run the new design. If is upheld it means that brawn, williams and toyota will have thrown away 2 races in which they could have run another design! It seems a little unfair to take points of the teams if they have been told by the stewards that their designs are legal. The only real looser is F1! A further complication has now emerged. 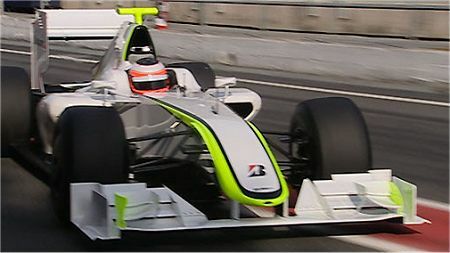 Brawn are to be sponsored by Virgin. THis means that it is likely that they will have a red car, which in turn means that they are exempt from any rules. How will the stewards now make their decisions if Ferrari and Brawn are on opposite sides of an argument (like in this diffuser case)? I have to agree with Clive fully. The beauty of any sport, business, or whatever is creativity. That's what gets you the leg up and even as another BMW Sauber fan, I gotta hand it to the teams using it and sticking to their guns. As far as the obvious appeal, I just shake my head. Has any more politics than in F1 been in any other sport? I just hate the 'board room' idea of deciding wins. Any results decided their are still purely speculative as the races may have unfolded in a completely different way if these controversial diffusers were never used. Lee: things are not quite as bad as that. If the diffusers are finally outlawed, the likelihood is that the results of the early races would stand - similarly to the moving floor issue of a couple of years ago. Raikkonen kept his win then and I think it would be hard for the FIA to justify changing the results after the event. But you're right that things should not be allowed to drift on for so long. All the teams are left in a quandary as to whether to develop new diffusers or leave things as they are. BMWF1 Guy: Agreed. And the answer to your question is no, I don't think any other sport has as many long drawn out legal wrangles as does F1. I can't think of a season in recent years that hasn't been spoiled by such nonsense. year after year on site after site we keep reading that Bernie and MadMax have/are screwing up F1, why don't the manufacturers just leave the FIA and start their own series? The answer can be found above ...... protest upon protest amongst themselves, they can't get along with each other how on earth could they go it alone? Concerning the diffuser issue, I'm glad someone buried that before they unloaded the cars and I agree, apeal or not, this will go the way of the flexible floor issue, points earned will stand. Public patience is wearing thin, changing results AFTER the fact would really bring out the moonbats. Well hopefully the way the FIA has handled the diffuser dispute will be one more factor that eventually forces the teams to set up an alternative formula. What has deterred then to date is a lack of unity plus the difficulties involved in taking that route. There are legal restraints on their ability to break away. At least the cars will race as tested so we'll know who was sandbagging and which is genuinely quick however I hear that McLaren might spring a surprise in the diffuser area. Given that the team has been quiet on this issue over the last few weeks I'll bet they turn up with their own version. Agreed, Leslie. That looks very likely in view of the silence of McLaren on the subject. If McLaren do that it's going to make the other six look pretty silly and leave them whistling Dixie. And isn't Branson a clever guy, what theatre. Virgin Blue is a big deal here. Well, the thing's been accepted for the moment so I guess the diffuser guys will have fun for a while. As soon as the Appeal Court okays it the other teams will start introducing their own versions and things will return more to normal, I think. Teams like Red Bull, Ferrari and BMW that, are going to have trouble fitting a double-decker diffuser, will just have to grin and bear it a bit longer.